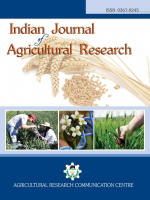 The analysis of variance revealed presence of significant variability among the 44 genotypes of rice for all the traits except for number of effective bearing tillers per plant. Higher magnitude of PCV and GCV were recorded for all the characters studied. Additive gene action was predominant for the traits, number of grains per panicle and 1000 grain weight. Based on D2 analysis the genotypes were grouped into 11clusters. On the basis of inter cluster distance genotypes from clusters IV and V followed by V and IX could be used as parents for future hybridization programme. Cluster mean analysis revealed the genotypes, JGL 21820 and JGL 21849 could be used in breeding programme for obtaining high yielding super fine grain segregants. Days to 50% flowering and 1000 grain weight manifested highest contribution towards total divergence, thus, these traits could be given due importance for further crop improvement. D2 Analysis, GCV, Genetic Advance, Heritability, PCV, Rice.